Join me in raising funds and awareness for United Hatzalah of Israel. I am doing this In Celebration Of Yom Tov . 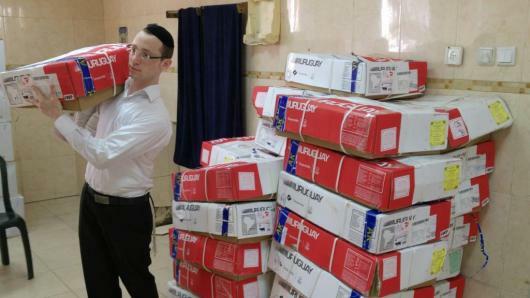 Help us fill the plates of the poorest families in Neve Yaakov.Its that simple. Your donation will help put good hearty food on the plates of people who are often forced to scrimp on the necessities. While we daven for a year of health, happiness and success you can be assured that the people who you help will keep you in their prayers and thanks. Chazal teach us that if gladden the heart of those dear to Hashem, He will gladden those dear to you. As always the Neve Yaakov food distribution campaign is run by volunteers with no overhead costs. For your convenience and with no commission United Hatzalah has graciously agreed to host this link and credit card processing facility. In honor of Rabbi & Rebbetzen Hurwitz. May you continue to be successful in all that you do ! I think of Neve Yakov often! This is in honor of Reb Meir Horowitz!! Doing amazing Kirov in Dallas!! !